When I first envisioned my roadster project it was defined by the short windscreen. Its a drastic modification, fundamentally altering not only the styling but the driving experience as well. Those few inches of plastic transform my Miata from a cute convertible into a purpose built driving machine. Here's how I did it. Originally, I planned to remove the glass windshield in one piece and then have a glass shop cut it down to size. Besides my inability to remove it in one piece, my advisory panel of coworkers talked me out of it. The biggest concern was the toughness of the glass when not supported on all sides. Polycarbonate was a far better choice since its flexibility allows it to bend in the wind instead of crack. I decided on 1/4" thick Makrolon (similar to Lexan) since the SCCA GCR specifies that thickness for front windshields on race cars. Not that I ever intend to race this rust bucket, but perhaps they have a good reason for using stuff that thick. With the a 14" by 60" piece of polycarb in hand, I got to cutting. With the windshield, hood, and trim removed I made a template of the new windscreen out of cardboard. The packaging the Markolon arrived in worked great. Making the template would have been easier if I'd kept the old windshield around. Without it, I made due with holding the cardboard against the car and cutting pieces off until it fit. I ordered a rectangular piece and I used one side of it as the top edge. Since the windshield is curved and laid back, it naturally has a curved shape at the top. Once I'd cut a piece that fit I used a few C-clamps to hold it onto the A-pillars and made certain it rose to the same height on each pillar. Then simply trace the shape onto the Markalon and cut it out. I used a small band saw with a metal cutting blade. Only the bottom, left and right sides need to be trimmed so the appearance of the cut edges doesn't matter. 1/4" thick polycarb is rather stiff but it has just enough flexibility to make the gentle curve of the Miata's windscreen. 3/16" should work nearly as well and is cheaper too. Even so, it didn't take much force to clamp it in place. The Miata's windshield is a simple curve so reshaping through heat or other means isn't necessary. Although the new windscreen is 14" tall at the center, the inclination means its only 6" at the pillars. I didn't account for this properly when I made my original measurements and the overall effect is less windshield than I intended. Despite this miscalculation, I liked the way it looked so I took the plunge and amputated the A-pillars. 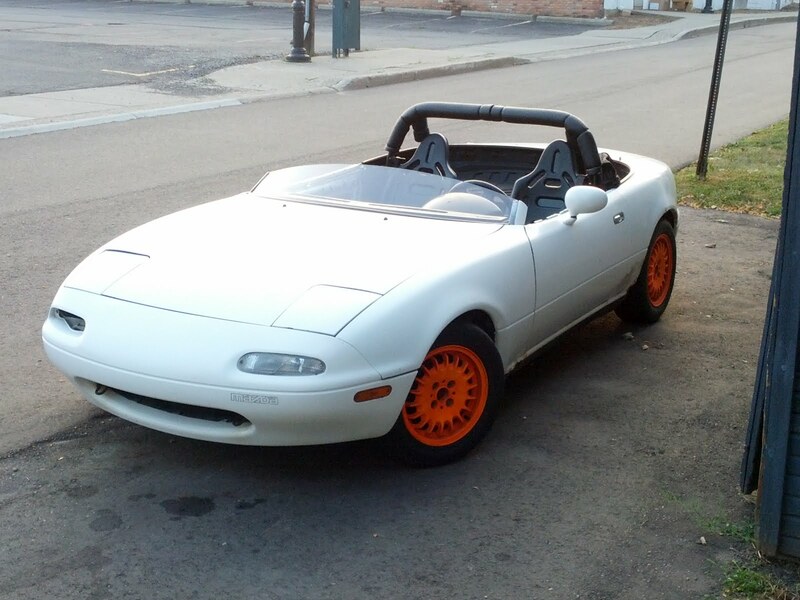 Miata after surgery. Pillars and polycarb have been cut. The cut line of the pillars is critical to the appearance of the windscreen. I wanted the cut line to continue the curve of the windscreen when viewed in profile and from above. After tracing the line around the pillars I un-clamped the polycarb and pulled out the sawzall. After cutting off the top of the windscreen I smoothed the edges of the hollow pillar with an angle grinder. The hollow pillars were not attractive and I sought advice from my coworkers again. Fabricating a sheet metal cap and welding it in place was the classiest option but also a lot of work and my welds are ugly. Great Stuff expanding foam was a simpler solution but I had to fill a rather large area and expanding foam has a tendency to stay soft in the center of large areas. Finally, Luke suggested Marine Structural Foam. Its a two-part epoxy that rises into foam less than a minute after being mixed. It cures completely in a few hours and its not soft and spongy like Great Stuff. I mixed the epoxy in a plastic cup and began stirring. The can says it begins reacting in 45 seconds. As soon as I was ready to start pouring the foam began expanding and overflowing the cup. A few moments later the foam was no longer fluid enough to pour. I managed to get enough into the pillars that it expanded outward and some dripped onto the floor. Thirty minutes later the foam was hard enough to cut with a razor blade. I sliced off the excess and smoothed down and shaped the remainder with a file. The foam is remarkably stiff and I understand why its called structural foam. Although the foam was strong enough to form the ends of the pillars it has a porous texture and yellow color that are not appealing. To cover it up I slathered on some Bondo and sanded it smooth before rattle canning it white. Anyone with a modicum of skill at body work could probably do a better job using higher quality materials. For me, the foam and Bondo worked well enough. Besides, this Miata has far greater body issues than the tops of the pillars. With the pillars finished I clamped down the windscreen to begin fastening it down. With no access to the back side of the mounting surface along the bottom I used sheet metal screws spaced about four inches apart. Along the sides, I could get to the backside so I used small countersunk machine screws with lock nuts. Although the windshield is countersunk, the hole in the body is a larger than need be to allow some float of the windshield. This small amount of motion allows for thermal expansion of the plastic. With the Miata transformed into a true roadster I took to the street. The immediate sensation is the wind on your face. At speeds up to fifty miles an hour the force is reasonable. Goggles should be worn but the wind is containable. At freeway speeds the wind provides a continuous scalp massage. I've taken to wearing a helmet for long trips at high speed. The next thing you notice is the visibility. Gone is the picture frame around the windshield that contains your view. Its remarkably different than a regular convertible. At times, the sensation is more like a motorcycle than a car. I've had a few weeks to enjoy my roadster and I'd do it all the same way again. This car never fails to put a smile on my wind blown face. It also attracts a lot of attention. I drove down to Flat Rock last week and two people snapped camera phone pictures of it while driving down the highway. People ask me if it's a race car at the grocery store. I catch some people doing a double-take when I drive past. That never happens when I drive my Neon. Link to website I procured the polycarbonate from. I want to thank the GRM forum and PC (AngryCorvair) for pointing it out to me. Also thanks to Luke for supplying the structural foam. Nice job! I did the same thing to a Spitfire. Going to do this to a Ford F-100 rat rod.